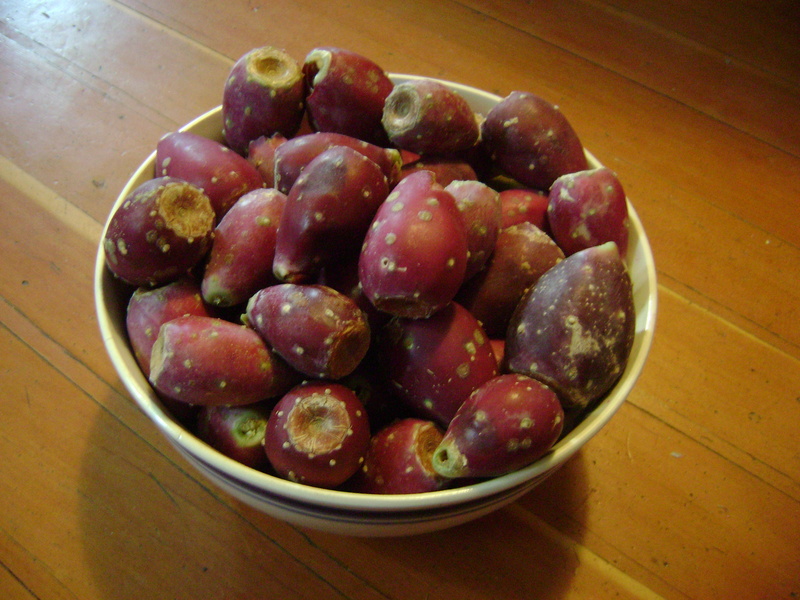 There are so many reasons to make prickly pears a part of your seasonal diet. Beyond the fact that they are free, abundant and easy to gather, they are also very healthy. Since the plants are wild and the growing conditions vary, the exact nutitional value varies. But all fruits are about 85 percent water with from 10 to 15 percent carbohydrates, 6 to 8 percent glucose and fructose, and abut 25 to 30 calories in a quarter pound. They also offer substantial amounts of calcium and vitamins C and A. For persons with diabetes, drinking even small amounts of prickly pear fruit juice (even a few teaspoons a day) can be beneficial for controlling their blood sugar. Recent medical studies done on student volunteers have shown that drinking prickly pear juice before a night of drinking can prevent a next-day hangover. For even more exciting ways to use prickly pear juice, check out The Prickly Pear Cookbook (Rio Nuevo Press). It is available through Amazon and your local bookstore would be happy to order it for you. This post was very nicely written, and it also contains many useful facts. I enjoyed your professional manner of writing this post. You earn it quite simple to understand. I think there is a nice site here… today was my first-time coming here.. i simply happened to find it conducting a google search. anyway, good post.. i’ll be bookmarking this article without a doubt.